Wynn (foot) caught two of three passes for 10 yards in Saturday's preseason game at Minnesota. Analysis: Wynn missed some practice time earlier in the week after sustaining a foot injury during the preseason opener, but the issue appears to have been relatively minor. The 25-year-old played only 12 snaps as he is facing an uphill climb to earn a spot on the 53-man roster. 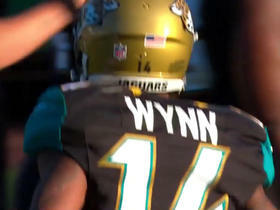 Wynn did not participate in practice Saturday due to a foot injury, John Oehser of the Jaguars' official site reports. Analysis: Wynn rushed once for five yards and caught all three targets for 39 yards in Thursday's preseason opener, but apparently sustained the foot injury at some point. The severity of the injury is currently unknown, but the 25-year-old depth player can ill afford to miss much time if he is going to make a lasting impression in camp. Jacksonville Jaguars QB Blake Bortles finds wide receiver Shane Wynn for a 19-yard gain.